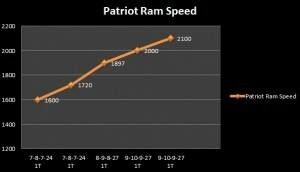 Patriot Memory has been a major player in the RAM market for as far back as I can remember. Patriot now also makes other products such as Flash Memory cards, Solid State drives, USB Flash drives, and peripherals. 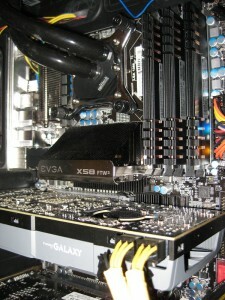 Today we will be looking at one of the latest RAM offerings, their Viper Xtreme series. 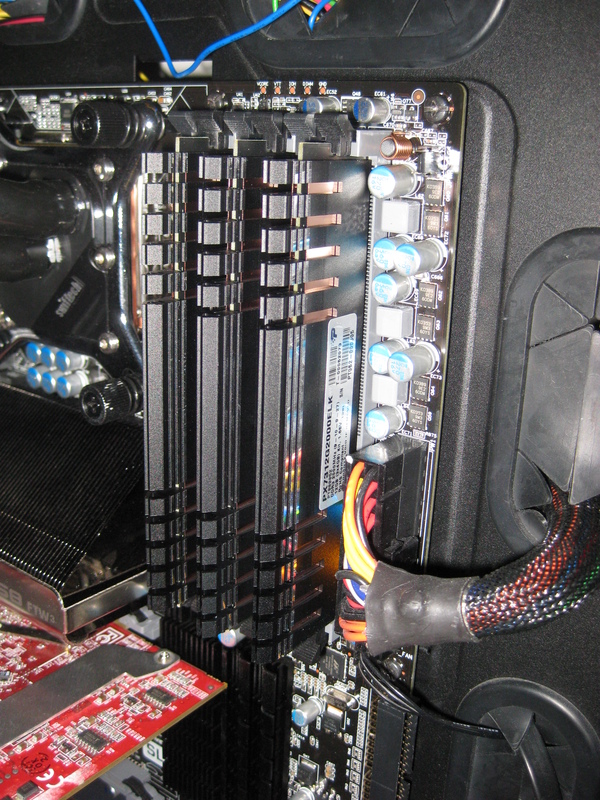 The RAM kit provided to us is from their EP (Extreme Performance) series of ram modules and comes in the 12GB (3x4Gb) flavor for this review. Note, they also have a 6Gb triple channel kit with the same specifications for all Intel triple channel platforms as well. Patriot states the EP series, “is the ultimate performance memory solution for the Intel® X58 platform.” As you may see from the pictures below, this is one of the better looking kits around in my opinion, with its two tone black and copper inlay heat spreaders. We all know looks are not everything though, so let’s see if they can hold up to their ‘EP’ title. 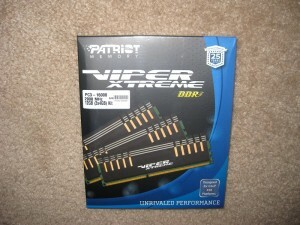 12GB (3X4GB) Patriot Viper Xtreme DDR3 2000 Ram, box. 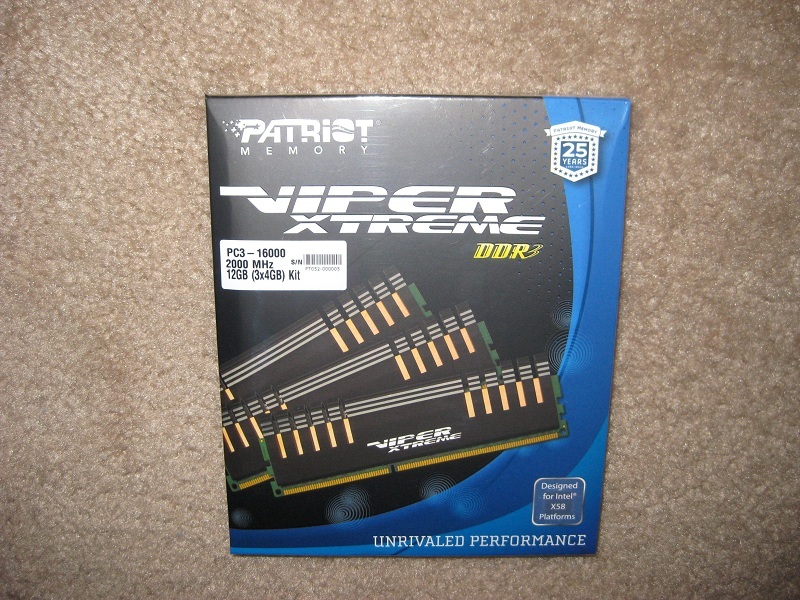 12GB (3X4GB) Patriot Viper Xtreme DDR3 2000 Ram. 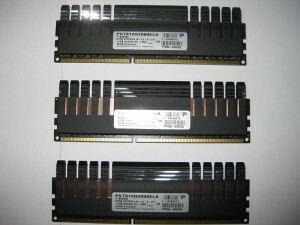 Supter Talent 6GB (3x2GB) DDr3 2000Mhz 8-8-8-24 @ 1.65v. 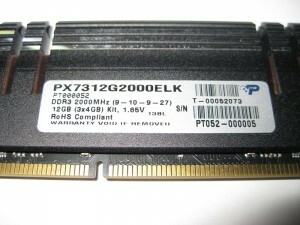 The triple channel kit number is PX7312G2000ELK (See picture below). You can see it states 9-10-9-27 @ 1.65v on the modules. However Patriots product page for this set of sticks states they should run 9-11-9-27 @ 1.65v. We will get some clarity on that later. Close up view of the label. Take a look at these modules. 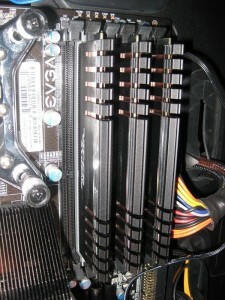 Their heatshield is a two piece setup made from a copper core with an extruded aluminum outer shell to remove heat and compliments the black PCB. All 3 sticks posing in the light. All 3 sticks posing in not so bright light. Here are snapshots of the sticks plugged in with the test PC. It matches the mostly black and grey theme of the EVGA FTW3. It was at this point she was memtested overnight (about 8 hours) and passed with flying colors. And some close ups to show off a bit of that shiny copper. Last shot is of the internals so to speak. I have to apologize in advance the photograph is not of the overclockers money shot, the Memory IC’s, but the informative SPD tab in CPUz. Well, enough run way modeling and probing, lets see hows these Viper Xtremes go down the track! 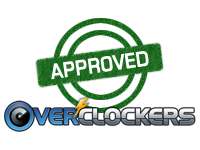 I took the testing and results approach from an overclocking standpoint and seeing how tight the timings would go at lower speeds, and how how fast the set would go at its rated timings. I kept the voltages set to the specified 1.65v actual (as read from contacts on my motherboard and digital multimeter). These kits will not be breaking any records over their smaller 6GB or 3GB siblings (higher stress on the memory controller pf the CPU potentially holding back maximum clocks), but dont let that statement fool you! 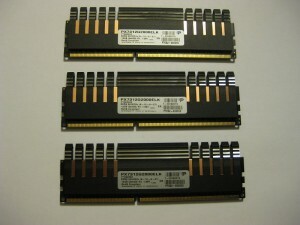 These are rated to 2000Mhz. They did that and more. We’ll start the benchmark parade by showing some Maxmemm screen shots of the kits Read, Write and Copy speeds at their rated timings, and the tightest I could get them at 1600Mhz. SuperTalent @ 1000Mhz 8-8-8-24 timings. Patriot Viper Xtreme @ 800Mhz 7-8-7-24 timings. 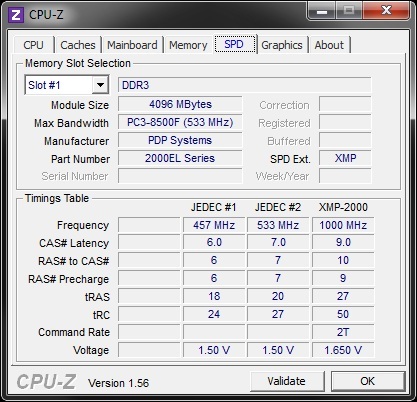 Patriot Viper Xtreme @ 800Mhz 9-10-9-27 timings. You can see from the results above that there is really no significant difference in speeds between the kits from these Maxmemm tests. Throughout the testing, these sticks favored a higher tRCD (the second in the 4 major timings) on its climb up the charts. It also had the tendency to selected a pretty loose tRFC timings as well. Those settings were on auto in the bios while the 4 major timings and Command Rate were set manually. The Viper Xtreme also managed to run through all these speeds with a 1T command rate i accidentally left on through testing! At 1600Mhz the sticks just would not run 7-7-7-24 timings at stock voltage and it was at this point in time I found the best scaling while keeping the tRCD one value higher than both CL and tRP. I still got them down to a nice 7-8-7-24 with a 1T command rate. 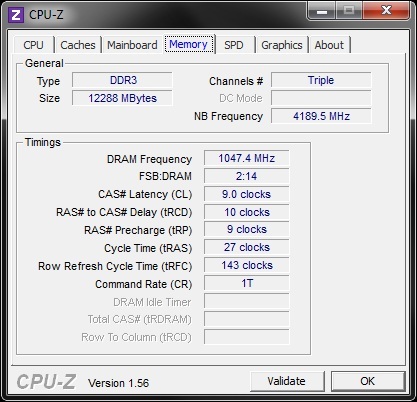 I managed to shoot up to a surprising 1720Mhz at those memory timings. 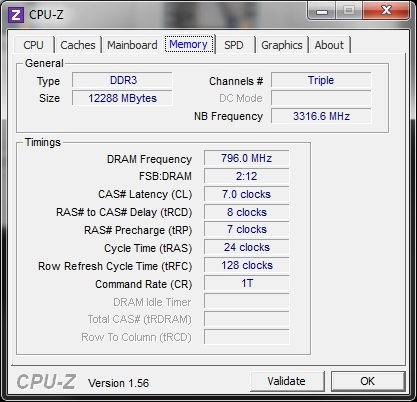 Pushing up to a 8-9-7-27 didnt boot, while 8-9-8-27 did and brought the speeds up to 1897Mhz. And finally we land at the memory’s rated speeds. Let me say one thing I noticed between my 6GB (3x2GB) DD3 2000 kit and this one. 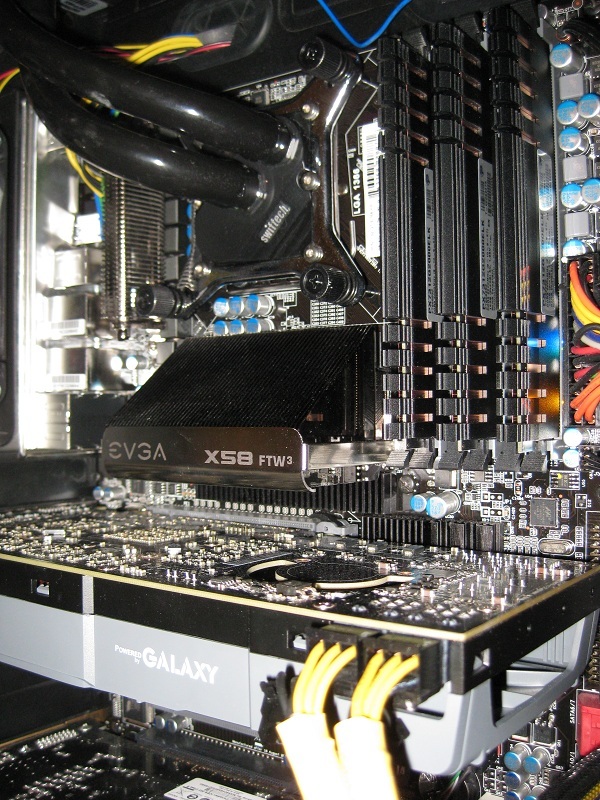 As you push higher with this 12GB kit, I had to pour on the Vtt to even get a boot none the less ‘stable’. Which by the way, to define stable, I ran about an hour of Prime 95’s Custom test which was just blend settings but to use 10GB of memory and I also played Battlefield Bad Company 2 at the 2100Mhz speed for about an hour. To hit the 2100Mhz memory speeds I was sitting around 1.45v actual for Vtt. Sitting at 2100Mhz memory meant my Uncore had to be at 4.2Ghz minimum. I was less with the 6GB kit, sitting around 1.40v with a bit tighter timings. Below is a chart displaying a summary of the memory speeds and timings achieved. 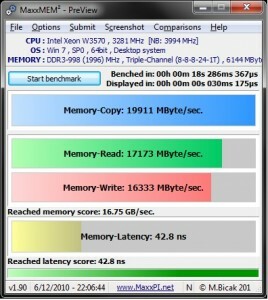 Just like the Maxmemm tests, you are not seeing a significant difference in performance in Super Pi either. I would have expected none in the 1M as that doesn’t really use the ram speed much when compared to the 32MB. Considering Patriots strong showing with more loose timings, I’m wondering if the sub timings in the Patriot sticks are a little tighter than the comparison kit and that is what is keeping them so close in the 32MB test. I should first note that I only had a few hours over the course of several days testing with these sticks. I may not have used every setting to push even further on speeds or tighten down on timings. 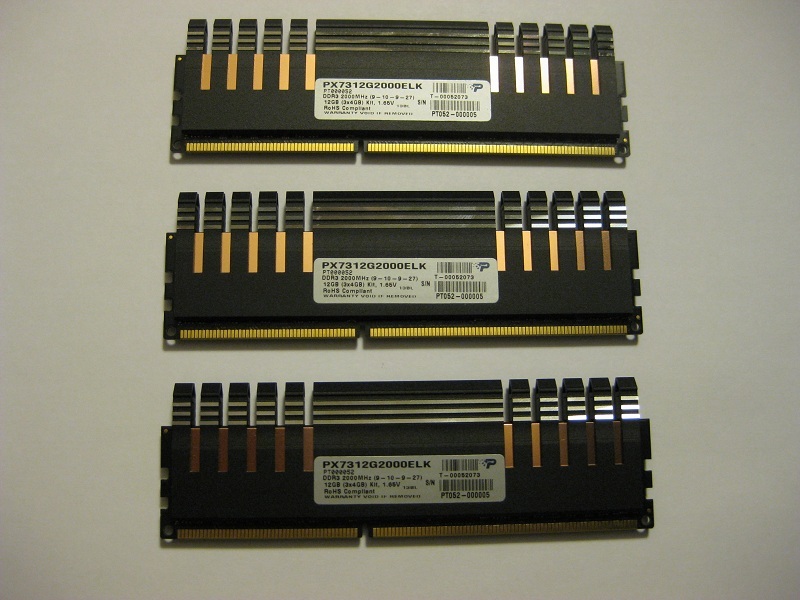 One also has to take into consideration that because of the higher capacity these DIMMs bring with them, that more stress is placed on to your CPU’s integrated memory controller. It shows here because I could easily push a different set of 6GB sticks further with a bit less voltage on the same CPU. But some may be more brave than I with voltages, specfically Vtt (I used 1.45 to run 32MB Spi tests and be ‘stable’) and Vdimm, or have a better memory controller on the CPU, and could squeeze even more out of these modules. Even so you get the idea these work at their rated speeds, have some headroom at the top end if your memory controller can handle it, and tighten down nicely at lower speeds. I wanted to revisit a point I made earlier, the discrepancy over the timings on the sticker versus the website. 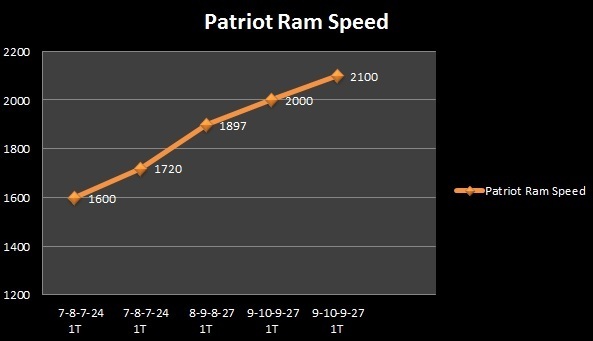 We contacted Patriot and their response was, “…[we] just changed the timings recently to something more compatible with more motherboards…”. So if you end up purchasing the older sticks with the 9-10-9-27 timings and it isnt working with your setup, try loosening the tRCD value up to 11 from 10 to see if that helps. 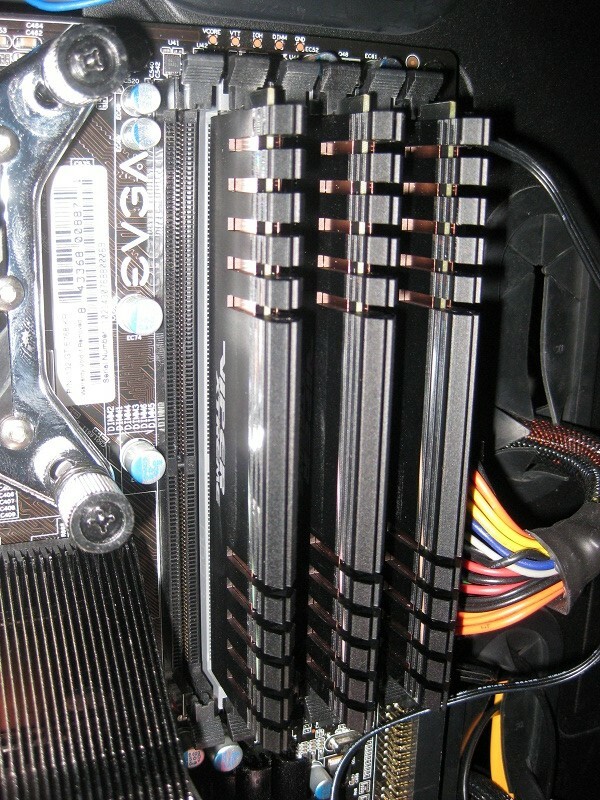 When I first opened up the box and saw the heat sink’s attractive black brushed aluminum and copper core, I was hoping its performance and overclocking headroom was as good. I can say the kit did not disappoint in the least. I would imagine you will find your CPU’s IMC the limit (via voltages and cowardess) before you top out on the actual memory. 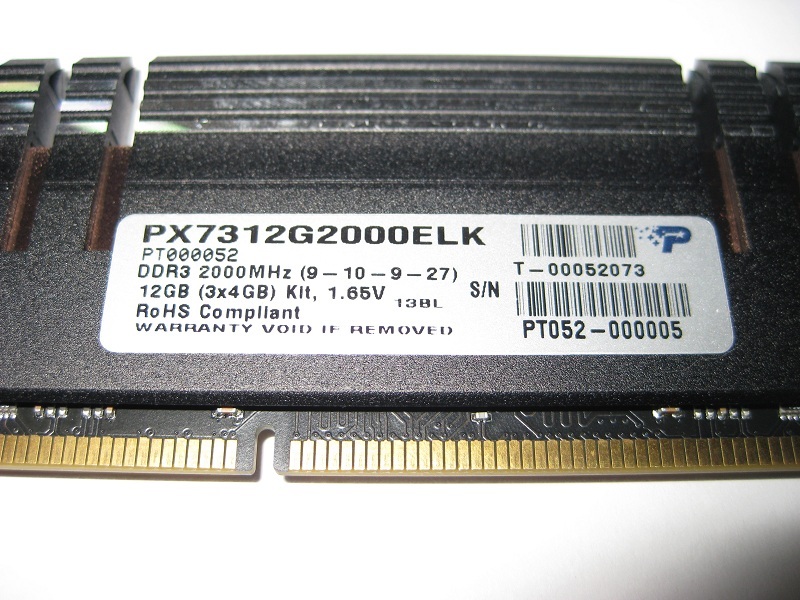 Currently this ram is selling for $299.99 at newegg.com which is about the median for 12GB (3x4GB) DDR3 2000 offerings there. Between its neutral but attractive color scheme, competitive pricing, overall performance, I wouldn’t look much further than this kit by Patriot if you need high performance and 12GB of RAM for your resource intensive applications. Thank you for reviewing this DIMM set. I always like to see what kinds of results other people are getting with the hardware before I drop my coin on it. The 12GB @2000MHz kits are not hugely popular, so finding information on this particular one was not as easy as I expected. I appreciate you doing the workup to OC on the timings, and the comparison to another kit. Keep up the good work!